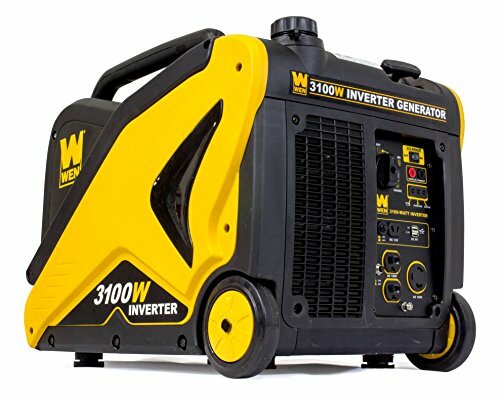 Inverter generators have a lot of advantages over the regular fuel-powered portable generators. They are more energy-efficient, produce cleaner electricity and make less noise. The only disadvantage of inverter generators is that they cannot produce as much power as conventional generators. When your electricity demand is not too high, inverter generators offer you a long list of other advantages. Considering getting one of these technologically advanced generators? Here are our recommendations for the best inverter generators. 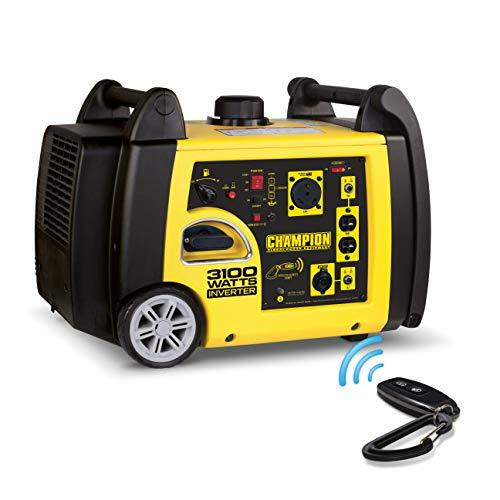 Champion is known for delivering well-built sturdy portable generators and the Champion Power Equipment 755337I is a good example. 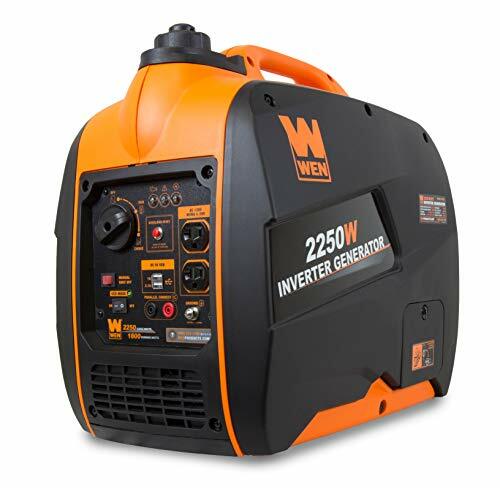 It has a strong cast iron sleeve casing with tires designed for a rough track but internally this inverter generator is sound, as well. For an inverter generator, the power output is quite impressive with 2800 watts running power and 3100 watts surge power. This power output is clean as well, meaning that it is safe to connect your sensitive devices like a DSLR camera or laptop. This champion can run for a reasonably long time with up to 8 hours at a quarter load. You’d be surprised to know that it has such long run time and impressive power with a small tank of only 1.6 gallons. In other words, it has a very fuel-efficient. It is even so fuel-efficient that it goes into idle mode automatically when not in use. The Champion Power Equipment 755337I is also one of the more user-friendly models on this list. It has a pull start, electrical start and even a wireless remote start. On top of that it is a portable design. There are two u-shaped handles on either end of the inverter generator but also has a larger foldable handle so you can roll it with you wherever you need it. The WEN 56310I is the best all-rounder on this list. With this we mean that all the key inverter generator advantages are there with comparable or better specs to the other models on this list. The WEN 56310I is good value for your money and very versatile. If you are looking for a portable inverter generator that is suitable for different kinds of purposes then this is the one for you. Let’s start with the above average power output of 2800 watts running power and 3100 watts surge power. Again, this is clean power with an impressively small total harmonic distortion of only 1.2% at a full load. The engine can run on eco-mode which makes it more fuel-efficient but that does reduce the max load to only 1000 watts. The run time is not noticeably long but still very decent with an expected 7.5 hours at a half load. One great advantage of the WEN 56310I is that you can connect a second unit with its parallel connection kit. This gives you double the power so that you can even run basic household appliances like a refrigerator and air conditioning or water heater. You can always monitor the power of this inverter generator thanks to three handy indicator lights; low oil, overload warning and output. Aside from the lights the panel has lots of outlets, include two USB ports to directly connect devices when you are outdoors. The design itself is also portable with decent wheels and a collapsing handle to pull it along. It is on the heavier side with nearly 82 pounds so you won’t want to pick it up with your hands. Briggs & Stratton is a big name in the world of generators and they guarantee good quality. This model is no different with its distinguishing factor how much power it produces. The main reason to not choose an inverter generator is its low power output but the Q6500 model challenges this idea with its 5000 watts running power and 6500 watts surge power. This is enough to run quite a few smaller household appliances at the same time or one to two large househould appliances. To illustrate, a refrigerator and freezer combo requires about 1000 watts running power but more to start up. With 5000 watts running power you can have the television, laptop, water pump and lights, on all at the same time. This means that this powerhouse inverter generator is enough to run the essential electrical devices in the house for shorter time periods. 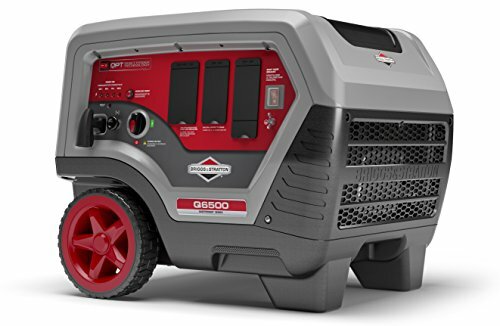 This makes the Briggs & Stratton Q6500 model a good option for households that only have occasional power outages for short time periods. Other advantages of this model are that it has a larger fuel tank than many other inverter generators while still being energy-efficient with a run time of up to 14 hours at a quarter load. Overheating and overloading shouldn’t be a problem either thanks to its air-cooled engine and circuit breaker. The compact and lightweight Yamaha EF2000iSv2 was designed for outdoor use. It only weighs 44 pounds, is very quiet and USFS, EPA and CARB compliant. Despite its small size, the Yamaha EF2000iSv2 doesn’t disappoint in terms of technology and run time. As we expect from Japanese manufacturers, they paid attention to detail. Great technological details are the air cooling system for the engine which still has very good heat retention. This means that you’ll still be able to use the inverter generator during both cold and hot weather conditions. The power is already decent with 2000 watts surge power and 1600 watts running power but you can double up on this thanks to its parallel function. The output is clean, can handle a wide range of applications and adjusts automatically to the load. Thought has also been put into the fuel tank with a fuel gauge, gasoline petcock and runs efficiently. You can expect over ten hours of run time at a quarter load with this tiny machine. Every single aspect of the design in some way affects the noise level and in this case lowers the noise level. At a quarter load the noise is only 51.5 dB and reaches up to 61 dB at a half load. The Honda EU2200I is strong competition for the Yamaha EF200iSv2 that we placed on number 4. The Honda EU2200I weighs just slightly more but is even quieter than the Yamaha. 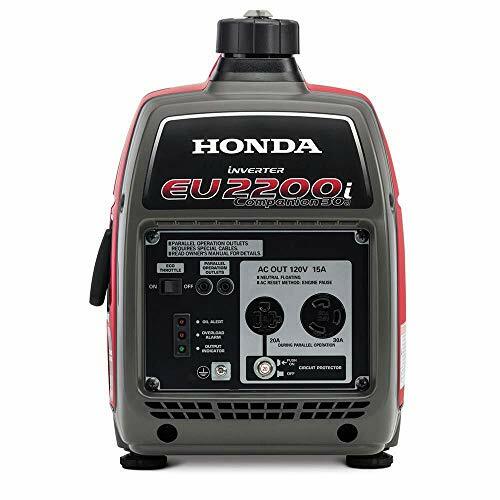 The Honda EU2200I weighs a light 48 pounds and comes with a built-in handle that is easy to carry. One of the reasons why it is so light is because of its tiny fuel tank of only 0.95 gallon. You’re first concern might be that it does not have a lot of run time because of tis small tank but its fuel efficiency solves this. It has a run time of just over 8 hours at a quarter load which is very respectable for such a small inverter generator. At a quarter load it also only produces a very quiet 48dB of noise, making it the most quiet model on our list. Another benefit is its low emission and CARB compliance which combined with the low noise make it a great option for use in nature parks and camping. The power is quite average for an inverter generator with 1800 watts running power and 2200 watts surge power. In eco-mode it will automatically alter the power output to the exact load. 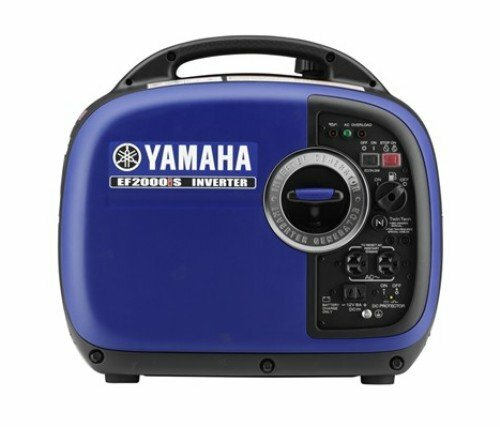 This popular model can operate a wide variety of appliances, making it perfect for portable use at home, camping, on the job site, or much more. Reliable Power is now at your fingertips with Honda's Inverted Generators. There are key differences between an inverter generator and a conventional generator. These differences is how you decide whether an inverter generator is more suitable for you than a regular portable generator. The main disadvantage of inverter generators is how much power they can produce. Whereas a fuel-powered portable generator can reach 10,000 watts or more, an inverter generator cannot produce more than 6000 watts. Whether this poses a problem depends on what you will be using the generator for. An inverter generator doesn’t have enough power to provide electricity for all the appliances inside a regular home so if this is your goal then you are better off with a conventional portable generator or a home standby generator. Inverter generators are more handy on camping and RV trips or for when you only wish to power a few household electrical appliances. When not a lot of power is needed you can make use of the design advantages of an inverter generator. Inverter generators are a lot more quiet than most regular fuel-powered generators. This has to do with how much control an inverter generator has over its power. Inverter generators can adjust how much power it is using to how much power is actually being used by the connected devices. This often saves on energy output which in turn makes the entire machine quieter. Another quietening factor is that inverter generator design pays more attention to mufflers and noise canceling technology. Basically, inverter generators are designed to be more quiet. Another design focus of inverter generators is its portability. Inverter generators don’t produce as much power as a regular generator which also means that its engine is smaller. A smaller engine means that the general design can also be made more compact. This is why inverter generators tend to be more lightweight and have smaller dimensions. Many inverter generators have a hand-carry design meaning that you can easily bring them along anywhere. This makes them a great energy source for camping trips when you don’t want to pack too much. Because of their smaller design, stable power, energy-efficiency and lower decibels, inverter generators tend to be more expensive than comparable conventional generators. However, the price tag comes with a list of advantages over other generator types. When design and advanced technology is what matters most to you, then an inverter generator is the better choice. Even with the greater price tag. If you have the budget, an inverter generator offers a lot of advantages over conventional fuel-powered generators. They are lighter, quieter and produce electricity that is safe for sensitive devices.